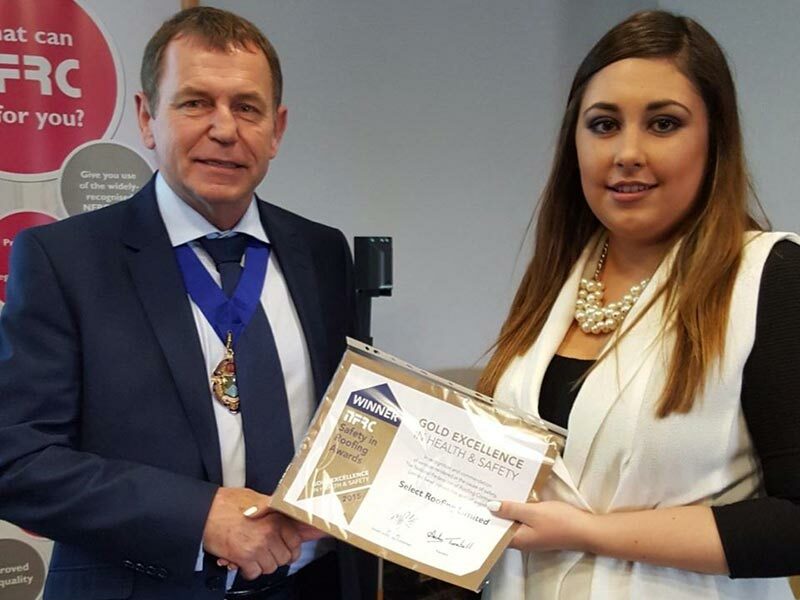 ^ Shirley Abbey, Health & Safety Manager with Select Roofing, accepting the Gold Excellence award from Andrew Turnbull, President of the NFRC. Select Roofing is honoured and delighted that our commitment to maintaining and improving Health & Safety standards has been officially recognised with a Gold Excellence award in the National Federation of Roofing Contractors (NFRC) annual Safety In Roofing scheme. The annual scheme covers all of Ireland and the UK, and Select Roofing is the only Irish company to be honoured this year – showing once again that we set the standards for others to follow. The prestigious award was earned through adjudication of a cross-section of Select Roofing projects in both Ireland and England. Health & Safety standards at these sites were inspected and monitored by a panel of experts, while the process also saw us submit comprehensive documentation outlining the procedures we implemented and maintained at each location. Select Roofing’s Operations Director, Paudi Reidy, paid tribute to all who helped achieve the award, paying special thanks to Health & Safety Manager Shirley Abbey, who oversees all Health & Safety procedures within the company. The award was accepted by Shirley Abbey at a ceremony held in Belfast.